In a small bowl, mix together the wet ingredients until very well combined. I recommend using a pumpkin or vanilla flavored Greek yogurt (pumpkin if you can find it!) and vanilla flavored almond milk for an extra burst of flavor (there really is a difference and it's awesome! ), but plain yogurt or milk will work too. In another bowl (very important to separate wet and dry ingredients for this recipe), toss together all of the dry ingredients and stir until well combined. To make oat flour, place regular old fashioned oats or quick oats in a blender or food processor and pulse until they resemble flour. Make sure they aren't chunky and really resemble a flour. Measure after blending and not before. Lightly pack the brown sugar when you add it - you may want a little more if you aren't used to healthy treats. Increase spices to personal preference. Combine wet and dry and stir until just combined. Over-mixing the batter yields denser pancakes. Grease a griddle or large nonstick skillet with nonstick spray (I use a coconut oil based spray) and heat the griddle to medium heat. 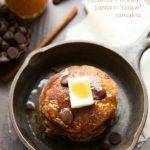 Place on a plate, cover with maple syrup or peanut butter (or whatever toppings you like on your pancakes) and enjoy immediately. To keep the pancakes warm while the others are cooking, you can place them separately on a large cooling rack (stacking makes them soggy) in a 200-degree oven UNCOVERED for up to 20 minutes - after that they start to dry out.